You don't have to follow the yellow brick road to find this emerald jewel. 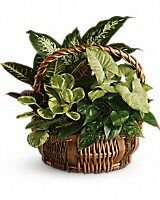 All kinds of gorgeous greens fill this basket that makes a perfect gift for men or women. Celebration or sympathy. Birthday or any day. So beautiful and bountiful it will deliver any message eloquently.